The Square in Horley was really a triangle. It was on a flat piece of land, about halfway up the long hill on which the village had been built. South of The Square a street of cottages and houses sloped down to the Sor Brook, and above, the Big Lane climbed towards Hornton. Both roads left from different corners of the triangle and from the third, the Banbury Lane went off in the direction of Hanwell. In the 1950s The Square housed a pub, a shop, and the Post Office. The phone box, which was erected after the war, was next to the letterbox, and the bus stop was on the north side of The Square. Where the main street led south was a village tap from which people who lived in The Square collected their water. There was a clattering of pails and shouting at intervals throughout the day as various families came to fill up, exchange the news and vent their feelings on the buckets that tipped and slopped. It was as caretakers of Mrs Herbert’s thatched house on the Big Lane corner of The Square that Lucy and Jim made their first home. Mrs Herbert was living in London. They had rooms at the front and the parlour window gave Lucy a dress circle view of all that was going on in the village. Any traffic that was passing between Banbury and Hornton had to turn a complete right angle round the house so it gave her an insight as to what was going on in Hornton as well. But there was little traffic then: once a day a bus left for Banbury, and once a day it returned, but if anyone in the village was going anywhere they generally passed through The Square to get there, and Lucy’s keen eye missed nothing of the comings and goings of the Horley community. The Astell family had suffered a grim loss. Mrs Astell had been killed by a lorry in a cycling accident on Warmington Hill. 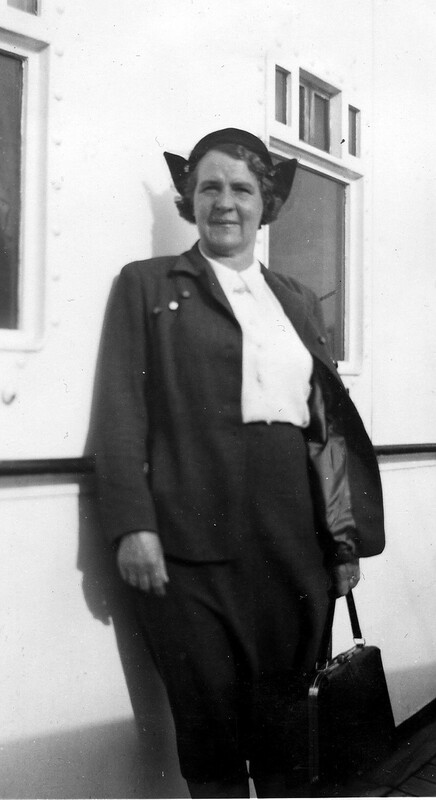 She left a husband and four children: Andrew, Peter, Mary and Janet. Janet was only six, so when Lucy stepped into the breach she had to provide a good deal of mothering as well as managing the house and preparing the food. She had much greater autonomy than at The Manor, and she entered into their family life with gusto and great good humour. The Astells lived as tenant farmers at Bramshill Park Farm. The farm ran over a steep bank and along the fertile valley made by the Sor Brook called Ragnalls Bottom. 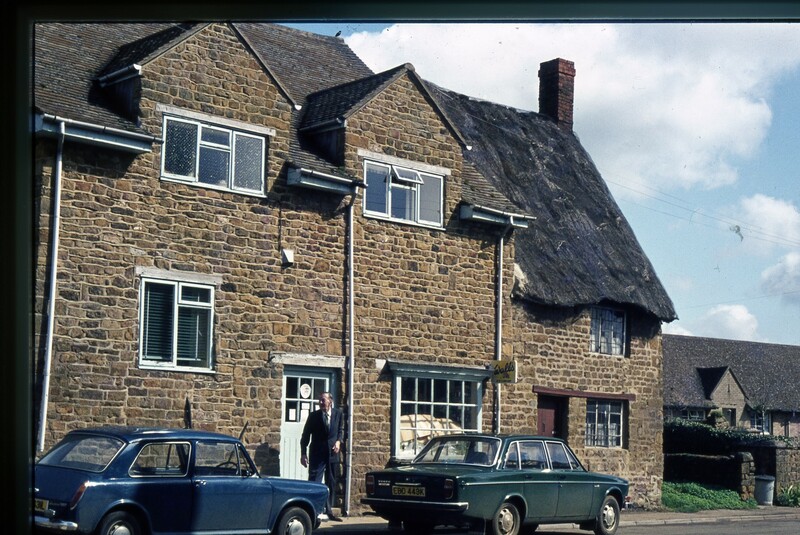 We believed the village legend had it that the farm, before the reformation, had been a small outpost, or grange farm, of the Abbey at Wroxton, a neighbouring village. The golden walls of the farm and the lichen-covered mossy roof gave it a feeling of antiquity. It stood impressively beyond a small fenced area of grass called The Green Court where the geese were kept. On a bank above it the gardens spread – a gentle mass of flowering shrubs and beds that blended with and softened the outlines of the house. To reach the Astells was only a short walk from The Square where Lucy lived, up the hilly Little Lane that ran past the farm. Each day Lucy’s journey followed the same pattern. She locked the door and hid the key before shouting a few words of greeting to anyone who happened to be about: ‘I say, it’s cold hain’t it? It’s still a-freezing. Watch them hicicles don’t fall off that thatch and ʹit you on the ʹead.’ she would shout cheerfully, and laugh about the icicles. A muddy track led to the farmyard where the mullioned windows of the cowsheds looked across it. In a ditch on the left a wooden farm wagon lay abandoned. Hot and laughing she would arrive at the farm’s back door. This entry was posted in Modern History and tagged Bramshill, The Manor, The Square on December 15, 2015 by thehorleyviews. Lucy’s life began to take on a new shape when she came to Horley and she knew an independence that had never been hers before. As cook at The Manor her role was clear, and when her work was done, her time was her own. The Stockton’s who owned Horley Manor were a family of local solicitors. They had two children – Miss Marjory and Master John as Lucy always called them. They entertained a good deal in a modest way and Lucy’s job was to cook the three meals a day that they and the household staff required. She also prepared afternoon tea, and made a quantity of soft, easily digestible food for the aged and infirm of the village that she and the maid distributed twice a week. Since in The Manor household master and servants ate the same menu and drank the same wine life was straightforward for Lucy. The fare was rich and tasty with meat three times a day and a good deal of pastry, gravy, butter, eggs and cream. The cakes tended to be substantial and the vegetables well cooked and traditional. Fish was not much in evidence and neither were raw vegetables, skimmed milk, and the muesli that we value so highly today. Pastas, pizzas, burgers and Chinese food were unknown, and the only foreign cuisine that occasionally appeared was what was called a curry. It was in fact no more than a beef stew with a teaspoon of prepared curry powder added. But curry with its strange flavours and hot spices were not entirely unknown. One or two men in Horley had been to India and tasted the food for real when they had done their soldiering as young men. Charlie Varney was one of them, but I do not recall his praising the food. Lucy’s days as cook may have been some of the happiest in her life. Lucy loved to feed people and there was constant activity, companionship and good humour. She took pride in the Stockton’s successes and took a nosey interest in their goings-on, so her work was always satisfying, and if it was possible, her spare time was even better. Lucy walked out with a number of young men at this time. One boyfriend, much in favour, fell from grace because some days after he had taken her out to tea, he tapped at The Manor kitchen window and asked her for the money for it. She counted it out from her purse and then hurled it at him. They never exchanged a word again though they both spent the rest of their lives in Horley. Lucy’s favourite pastimes were whist drives in the winter, and in the summer gentle walks across the fields to a pub, a little tennis, and best of all, dancing in the gloaming on long warm evenings. It was while she was at The Manor that she met Jim Eadon. He and his friend Bob Gilkes played tennis with Lucy and her friend Violet, the maid at The Manor. Jim came from Hornton. His ‘Dad’, a fine looking man with a waxed moustache and gentle ways had once been a soldier and had fought in the Boer War. He still had his red jacket to prove it. Because of his dad’s soldiering, Jim had been born in Wellington Barracks, Chelsea, but the family had returned to Hornton where his parents kept The Red Lion pub [or The Dunn Cow?] for some time. Jim worked on the North Oxfordshire opencast ironstone mining works. 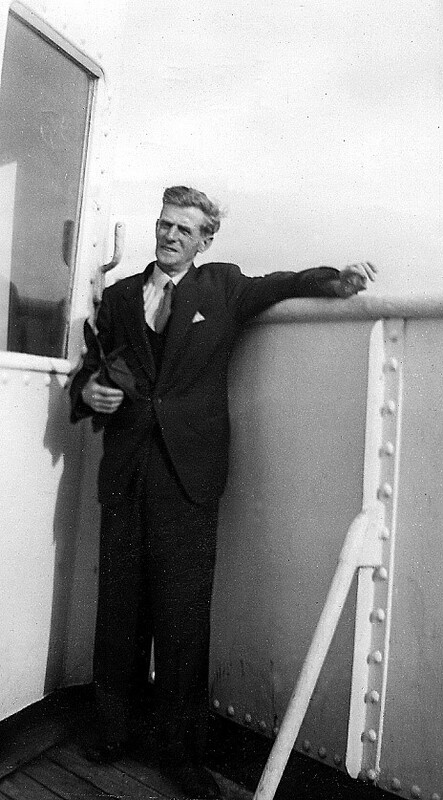 He worked with his father, and they were known as ‘Big Jim’ and ‘Little Jim’ – the latter taking after his tiny sharp-witted mother. That he never completely broke away from her dominance is not surprising, for she was a tiny dragon of a woman that could have dominated an army. Jim was every bit as quick-witted as his mother, but he had shyer and softer ways and was happier with Lucy. He found comfort in her stock phrases of ‘make yourself comfy’, ‘that little bit don’t matter’, ‘ʹave another’, ‘noice, hain’t it?’, and, as evening drew on ‘we’ll be ʹaving a drop [a drink] hin a minute’. After a respectable period of courtship and engagement Lucy and Jim got married in December 1933. Jim was 30 and Lucy 26 – rather older than most people on marriage in those days. After the ceremony at South Newington where Lucy’s family lived they returned to Horley to begin their life together. With her new status in life came changes: Jim would not let her cook at The Manor. He liked her to be at home in the evenings. Lucy left The Manor and moved down the lane. 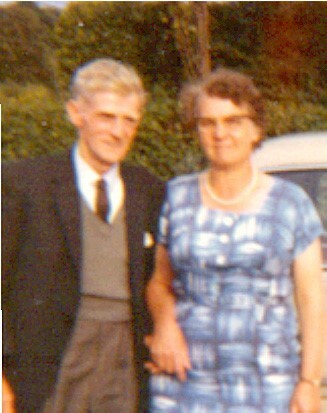 She and Jim lived in The Square and she went to work on a daily basis with the Astells who lived at Bramshill Park Farm. Jim and Lucy got on remarkably well. Lucy’s only slight disappointment was Jim did not eat much, but that did not stop her cooking too much for him. When she had been cook at The Manor, she and Violet the maid had taken food to the poor and ill of the parish, and Lucy had seen the foul conditions that once active people had to live in if they were not able to look after themselves, and had no running water or sanitation. If they were weak they had to use any container as a lavatory, and they had no strength to empty it – harsh unpleasant details that are rarely recorded or spoken about. She and other women in the village were sensitive about the problems which the lack of drains created, and went to great lengths to keep their lavatories clean, using large quantities of strong- smelling disinfectants such as Dettol and Jeyes Fluid to disguise any unwanted smells. This entry was posted in Modern History and tagged Bramshill, St. Etheldreda’s Church, The Manor, The Square, The Vicarage on December 14, 2015 by thehorleyviews. It is about Lucy whose family came from Ireland (to Hook Norton) when she came to work as the live-in Cook at The Manor. 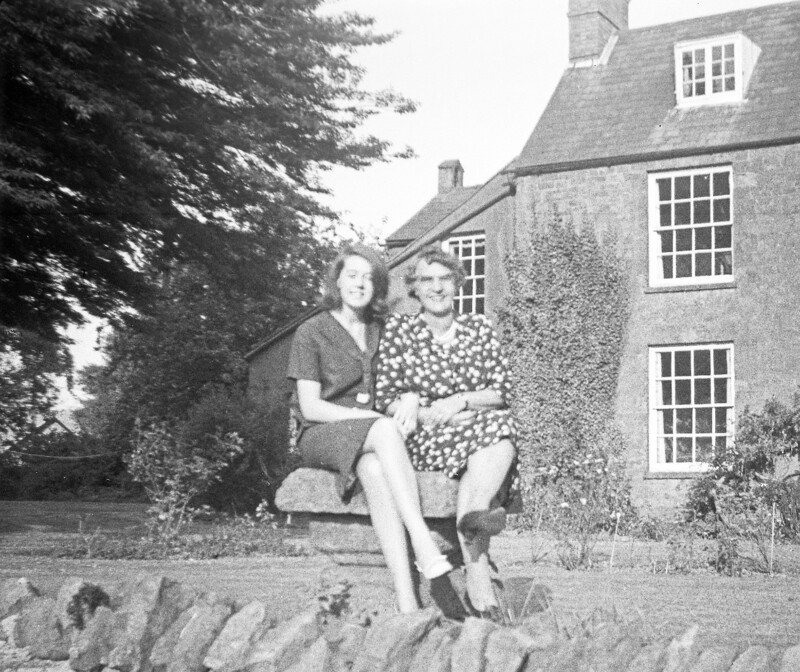 She married Jim (from Hornton) and they moved to a cottage in the Square, they then moved in to Chapel Cottage where they lived for the rest of her lives. Their story touches on how much slower and simpler life was and yet how much harder; such as fetching your own water and milk. Whilst today we rush in and out of Horley without giving it a second thought, we get frustrated if the broadband is slow and expect to be able to buy any type of food online and then get it delivered to our doors. We have so much more today that we take for granted. “A Portrait of a Country Couple” by Honor (Morgan) Berry for her children Felicity and William when they were young, so they could know something of her childhood. Who Lived in Horley in 1965? A Vanished Past – What’s in the Volumes? A Vanished Past Vol.1 – Who Has Contributed, Who’s Missing ? A Vanished Past Vol 2 – Who Has Contributed? Hope you’re enjoying these glimpses into Horley’s past? Some aspects have really changed and yet there is something enduring about our village community that still prevails today. I have worked with Clare Marchant to “look inside” her book and share an overview of the contents, contributors and the stories of life in Horley earlier in the last century. Remember these are just glimpses, that we thought might interest you but there is so much more. It would make a wonderful Christmas present. Rgds Debra. This entry was posted in Modern History and tagged A Vanished Past, Bramshill, Clare Marchant, The Manor, The Square on December 13, 2015 by thehorleyviews.